The machine is a closed loop system consisting of several components. It is a well closed chamber where sand blasting is taken place. Abrasive proof materials and surface treatments enables cabin durable and resistant to abrasives. There are gloves attached to holes on cabinet front where there are observation windows. Machine comes with one manual control blast gun. Operator blasts the parts from the outside of the cabinet by placing his arms in gloves attached to glove holes on the cabinet, viewing the part through view windows and, manipulate spray gun manually. It is a siphon blast system, or sometimes known as suction blast system, using compressed air to create vacuum inside blast guns barrels. The negative pressure pulls abrasive into the blast gun via abrasive proof pipes. Compressed air directs the abrasives through blast nozzles impacting on glass. Abrasives are mixing with compress air during ejection, which fully utilizes compress air. Compress air quantity and abrasive amount are adjustable. Adequate mixing ratio minimizes abrasives and air consumptions. It is a standalone structure. Dust separation is achieved by means of cyclone. This process is a very high efficient way to capture reusable abrasives for recycling from disposal dust. During sand blasting, two types of contaminants are generated. a)　Glass powder physically eroded from glass surface. b)　Abrasives which become smaller in size or losing sharp edges after impacting on glass. These shattered abrasives are no more helpful for blasting. Remaining abrasives are still large in sizes with sharp edges. They are reusable. Dusts are light in weight and are separated from reusable abrasives, which are relatively heavier in weight, by this powerful cyclone system. There is an abrasive storage inside separating system. 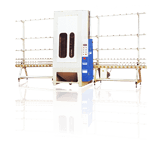 Recycle abrasives are separated and left in the storage and are to be blasted automatically. Virgin abrasives are re-filled and loaded inside the abrasive storage. This is an absolutely closed loop design providing a truly free of dust environment. 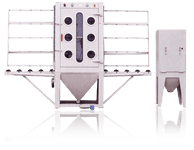 After separating, non-usable abrasive and dust are eventually collected in this dust collector. It consists of inlet, main and exit conveyors with idle rollers support. Main conveyor is inside blast cabinet. Glass is loaded on inlet conveyor and is passed into main conveyor manually. When sandblasting is completed, glass is moved onto exit conveyor manually.